Welcome to NKU's HNR 303's site on the world wide web. Our class has worked long and hard to produce a site that would pay tribute to the talent of Herman Melville and the various artists who used his material as the basis for some of their works. This course was led by Prof. Robert Wallace, a man devoted to the enjoyment of literature and accompanying arts. Please take a moment to peruse this site, and I hope that before you leave, you will have a taste for Melville and the arts as well. 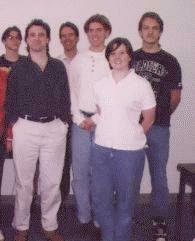 This photo was taken during the Spring 1996 semester; all links point to the work we did that year. Aaron Zlatkin, * Lindsay Hixson, * Rob Kallmeyer, * Kristen Sekowski, * Regina Saylor-Dismuke, * Melissa Magner, * Bill Fletcher (Kermunklin), * Michael Gallagher, * Prof. Wallace, * Brian Cruey, * Gina Brock, * Nate DeGroff. One who could not make it into the picture was Abby Schlachter. 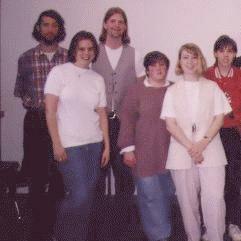 The 1997 National Association for Humanities Education Conference in Provo, Utah. "Landlocked Gam" --Students from NKU and Rockford College create, discuss, and get snowed on. Virtual Gallery --Digital reconstruction of the "Landlocked Gam" exhibit. Review of the "LandlockedGam" -- as printed in Melville Society EXTRACTS. Check often for updated info. Write to us if you have any questions, and we will try to respond.